By Vincent Morgan	| Published on Monday, June 7, 2010. 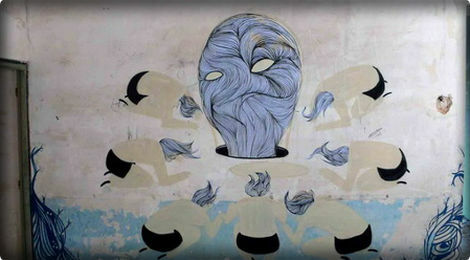 Interview of Hyuro, street artist from Valenza. FC: Tell us about your beginnings and your discovery of street art and graffiti. I began painting in the street not so long ago. Before, I used to paint on canvas, and I am still doing it, although no much at the moment. I discovered street art when I met Escif. After hanging out together for a while and following his work, I decided to try it on my own…and it seduced me rigth away. FC: What's the meaning of your name? The meaning of HYURO, is just a mix between my two surnames. During my last period as an indoor artist I was longing for a change. I began leaving aside the decorative part of the painting, and focusing more on the comunication side, expresing myself in a diferent way. One thing brought to another. When I got the chance of painting on the streets I discovered that it was the perfect place to continue working with what I just had started. I am not ready to define my work, I have an idea of where I want to take it, but for the moment is not mature. Most of my inspiration comes from my own experiences, from there I start working on different ideas. Worries, scares, identity. freedom.. In general I look inwards to analize myself as a human being, and those inquiries are the ones I am interested in. FC: How did your style evolve? My style is still evolving rapidly, it is changing shape every time I go painting. FC: What’s your taste in movies, music and books? Movies: Billy Elliot, it inspired me the strenght that we have when we believe in something. Fight for your dreams they might come true. Books: I like any kind of politics, sociology, debates..philosophy. Music: I am open to any kind, depends my mood, in general I like rock music. FC: Name an artist whose work you respect and admire. Let me think...Guayasamin, Swoon, Egon Schiele, Dran, Basquiat, Picasso, Blu, Klimt, Escif, Rothko, Hundertwasser, i can not stop if you wish, there are so many artist that i admire, from each one diferent moments of there art. Just to mention one: Una vida sin cuestionamientos, no es digna de ser vivida. “A life without questioning is not worth living”. mmm…nice question…let me think about it…I will be more interested in knowing which music people would choose to my work. FC: Tell us about the choice of using only black and white paint? Black, is the color I feel most confortable to work with at the moment. I don't feel like adding any other color. I prefer to concentrate on the idea and the drawing. But as told you before I am still changing and I hope I always will. FC: How do you organize your paintings? Do you do sketches before? Do you have any “gestures", characteristics or paint habits? What tools do you use? Brush, stencils, spray can? Most of my work is sketched before, more than anything is for the outside work to take as little time as posible, working with brush is not as quick as the spray, and working in the street doesn't give you much time to paint and nor for mistakes. FC: Do you need something particular to be creative? Reading, searching images different artists. FC: Do you feel the work you are doing is something that should be preserved or just stay ephemeral? I love the idea of being ephimeral. It couldn't be any other way on the streets. FC:What kind of reaction do you want your art to evoke? Just knowing that people stop and try to interpret my work…that's enough to make me happy.